Henry is down for his nap, so it’s time to get some first thoughts down. There is a lot to think about! I want to preface this post by reminding readers that I believe that everyone should be using the best tools to support learning in their local context. 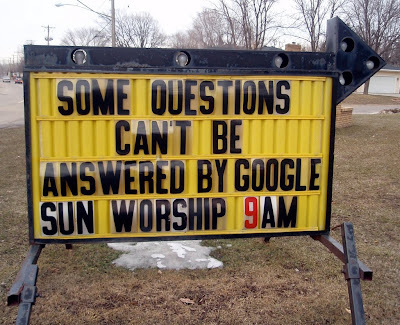 This may mean Google, Microsoft, Apple or Bic 😉 Indeed, this image was used during the day and reminds us that we have to constantly dip into our learning toolbox – that even includes getting outside once in a while! This post goes on to describe how we can attempt to evaluate and prioritise the learning that took place. Anyway, I want to move on to the positive! The biggest learning moment for me (apart from the fact that all Google employees talk very, very fast) came right at the start of the day when Mark Wagner shared Google’s philosphy during the opening stages. I have embedded the presentation below, it can also be found here and I have taken out two slides in order to support my points. 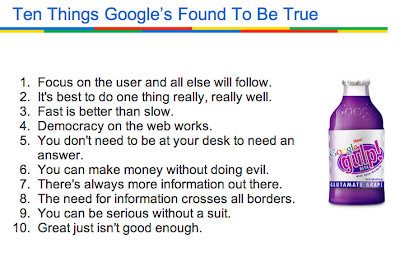 Mark shared Google’s company philosophy (full details can be found here). Including some 20% time into the next staff Inset and into lessons – at least on a trial basis. Develop co-construction of some aspects of the curriculum with students and get them to run Inset sessions to all staff. I know that most learning takes place outside of school, and certainly outside of our geography department, so I need to develop better ways in which to encourage and support learning away from school. 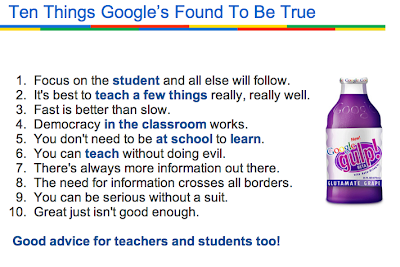 The ‘Lead Learners’ tag has an important role: no one presented themselves as an expert just some people with a story to tell about using Google tools. This is a shift away from the gatekeeper of knowledge that teachers often see themselves as – it’s time to let go and become learners with our colleagues (I intend to include staff and young people by using that term) when it’s appropriate. Imagine the fun that we could have! Of course, a huge range of tools were presented to us, and there is a need to evaluate and play with these a little before sharing some of their potential uses. One tool that I have used for a few years now that has helped me to evaluate any new tools is the circle of unconfusiness. 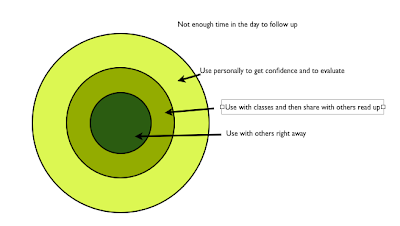 I shared how the circle may be used on the GTA Posterous blog. And all of that in the first 20 minutes. You can imagine the fire hose of ideas that followed! I enjoyed reading your reflection of #gtauk. A year ago I attended the GTA in Boulder, Colorado. I had a similarly excellent experience. I would like to welcome you to the GCT community. It's a great group!